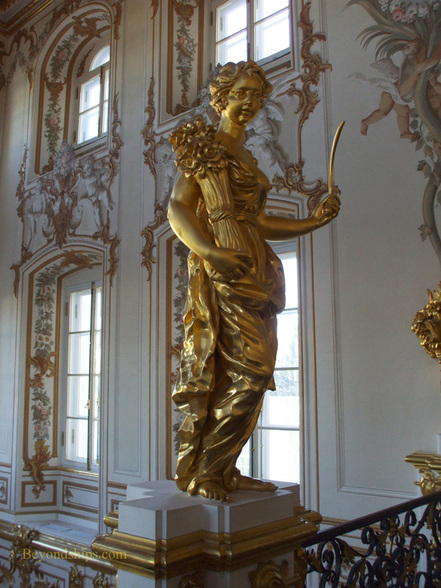 Above: A gilt statue on the Ceremonial Staircase. 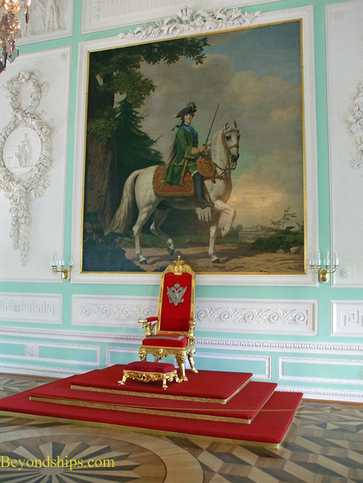 Above: The throne rests on a podium before a portrait of Catherine the Great. Below: The White Dining Room. 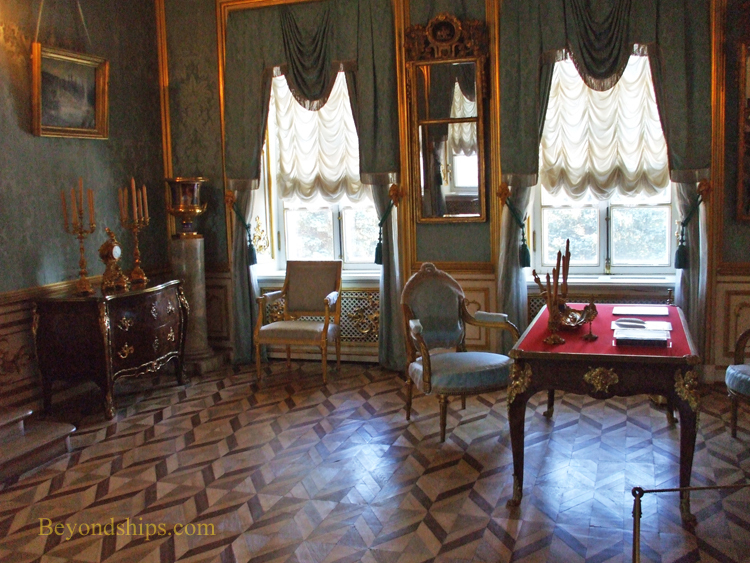 Below: One of the smaller rooms - - the Divan Room containing a divan allegedly given to Catherine the Great by Grigory Potiomkin. There are only about 30 rooms in the Grand Palace. 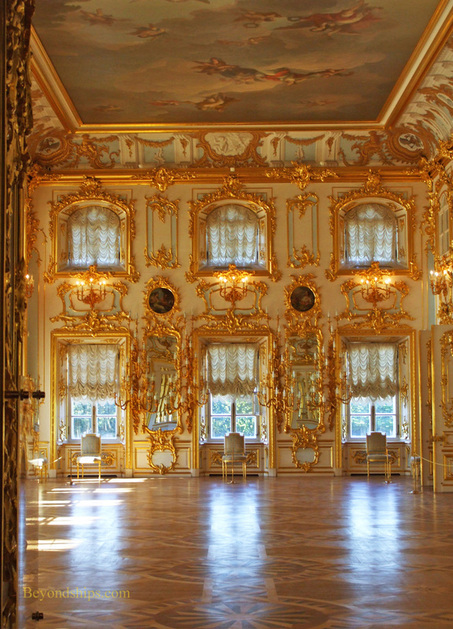 In contrast to the restrained decoration outside, the interior was a riot of opulence. For example, the Ceremonial Staircase near where visitors enter is alive with gilded statues and topped by a ceiling fresco which is an allegory of Spring by Bartolomeo Tarsia. As lavish as the staircase is, there are even grander rooms ahead. The two tiers of windows and the mirrors in the Ballroom (Dance Hall) flood the room with natural light. Gilding embellishes the walls giving the room a golden glow. Its not hard to imagine courtiers, diplomats and grandees swirling across the parquet dance floor as the Empress Elizabeth looks down from the epic painting that covers the ceiling. Along the same lines, the Audience Hall is a double height space designed by Rastelli. 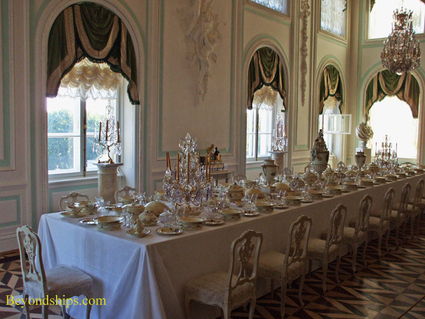 It was used for smaller receptions with the Empress Elizabeth. 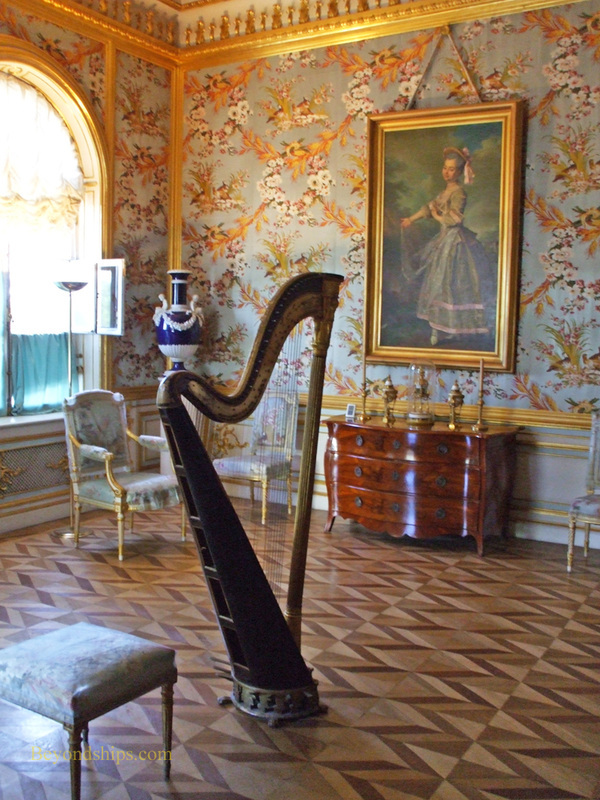 The Throne Room, the largest room in the Palace, was used for grander receptions. 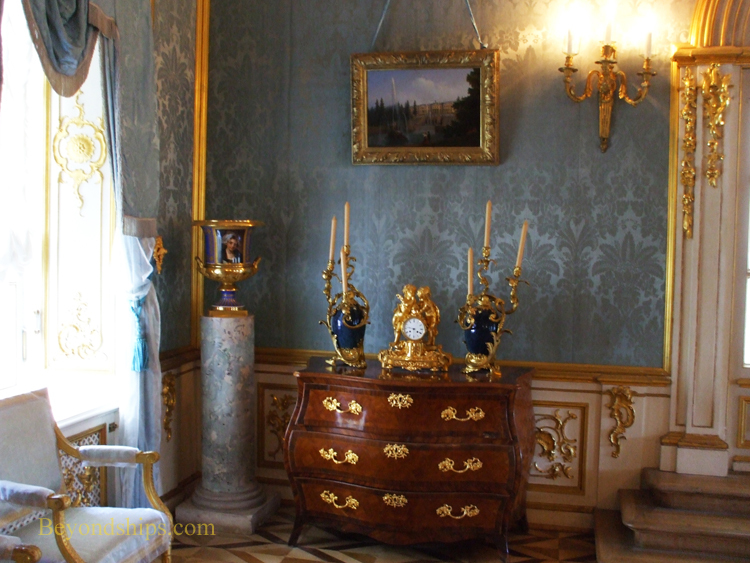 This room was re-done in 1777 by Lukas Pfanzelt in a more neoclassical style. The painting behind the throne is of Catherine the Great in manly-garb. 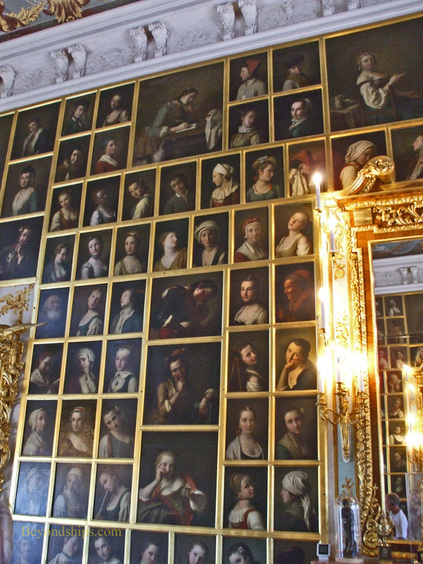 Another interesting room is the Picture Hall, which has 368 paintings of women of various ages and in various garbs so closely packed together that there is no wall space in between the pictures. They were all painted by the Italian artist Pietro Rotari and were purchased by Catherine the Great after the artist’s death. But what is remarkable about them is that if you look closely, you'll see that the same model was used for all the paintings. Thus, the wall is covered with 368 paintings of the same person. 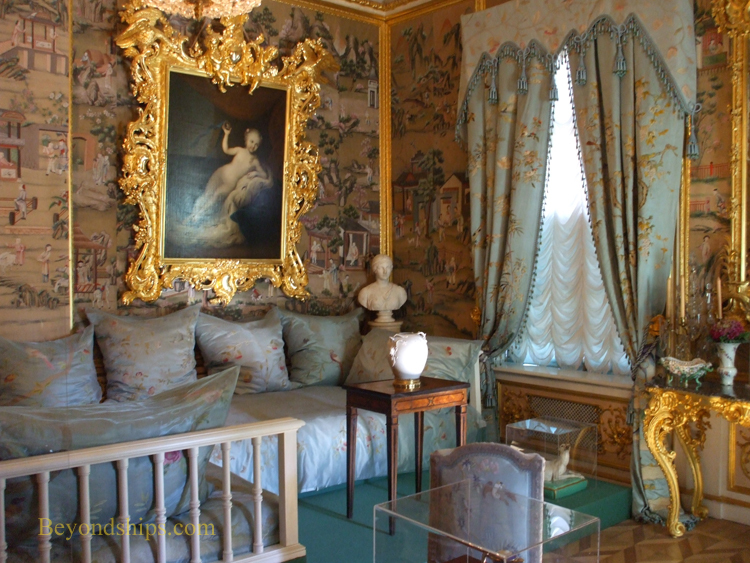 There are also a series of relatively more intimate rooms that are open to view. These were places where few members of the court were permitted and were where the royal family lived. Most are quite luxurious. Only the Oak Study reflects the more Spartan décor of Peter the Great's era. Above: The Partridge Drawing Room so named because of the partridges weaved into the pattern of the French blue silk wall covering. 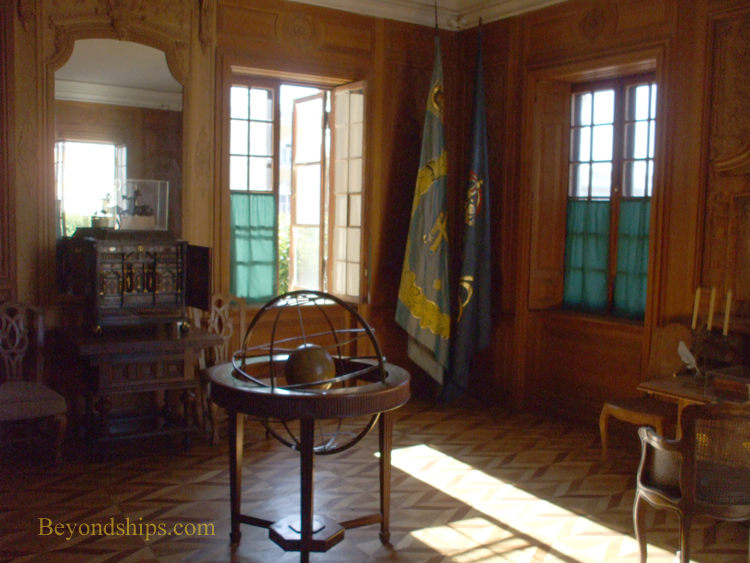 Below: The Chesme Room is named in honor of the Russian naval victory at Chesme in 1770. 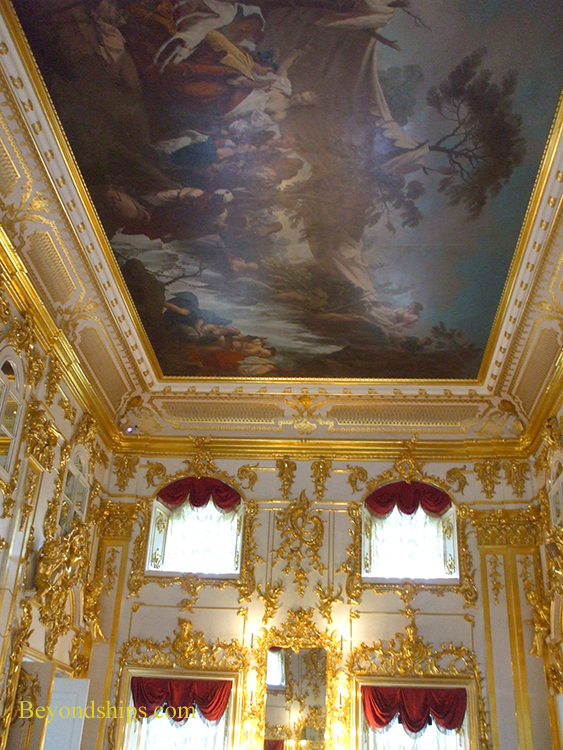 Like the Partridge Drawing Room, the decoration dates to the rule of Catherine the Great. Above: Peter the Great's Oak Study. Left: The Blue Reception Room.